This project uses a TMP102 temperature sensor, an mbed microcontroller and a Python script to make temperature measurements, and add them as new rows to a Google Docs spreadsheet. The original aim of this project was to prove a point that the university library’s airconditioning was working suboptimally during busy revision periods. 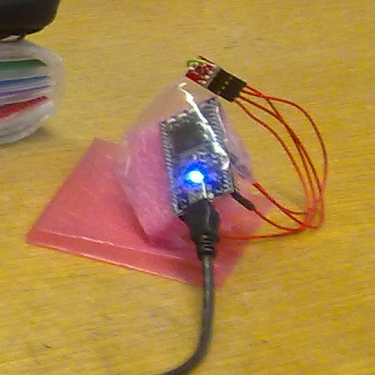 The implementation was really simple: the Python script asks (polls) the microcontroller every minute for the current temperature, and then logs it as well as uploads it to the Google Docs spreadsheet using the Google Spreadsheet API. 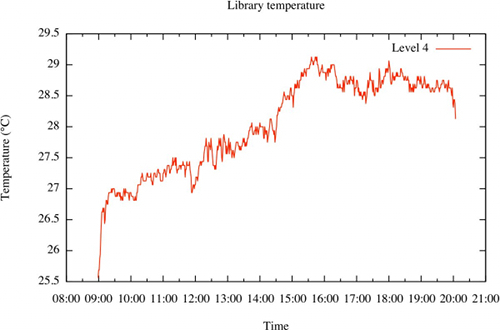 The data logged by the Python script could be graphed using gnuplot (see below), or the data in the Google Docs spreadsheet could be visualised using time series chart gadgets on [my Google Sites “playground” page](http://playground.m01.eu/live-temperature). Time series chart gadget screenshot. Temperature chart for May 8, 2011, created with gnuplot. 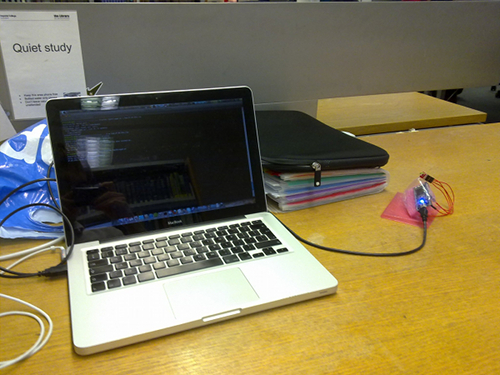 Temperature logging equipment in action.